Behind the media's candelabra, there is a distinct similarity for the love of America and laser-focus on defense, infrastructure, and big deals between Donald Trump and Ronald Reagan. Obviously both are Republicans, but both weren't scions of the GOP establishment. Rather, both Presidents started off in that other party...the Democratic one, which left them and millions of other moderate Americans behind. 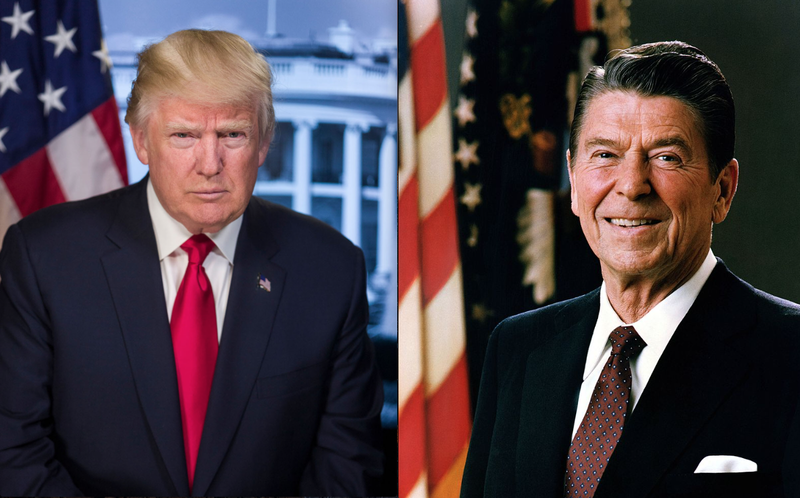 If history is any indicator, Reagan 2.0 should continue to be a boon for stock market investors as the government will ramp up spending on defense and infrastructure, while reducing regulation, lowering taxes, and putting America First (read as smart trade negotiation.) On the proverbial back of the envelop is the calculation of Dow 25,000 by the end of President Trump's 1st Term; there are estimates of Dow 30,000 too, but those make some really difficult assumptions. It is going to be nearly impossible for President Trump to accomplish everything he sets out to do in his first term. Nevertheless, if President Trump can navigate the tricky deal of providing health care coverage for millions of Americans while simultaneously lowering taxes, reducing regulation, and securing our borders he'll have succeed in the bulk of his goals. Even on the belief that he will accomplish just some of these monumental tasks, the stock market has risen some 3,000 points in the past 4 months. Investing in America has never seemed brighter; companies are regularly beating their earnings expectations and a pipeline of new incentives are on the horizon. Corporate tax reduction coupled with the ability to repatriate trillions from overseas is likely to bolster the corporate bottom line immediately, while the effects of ongoing, material reduction in regulations will provide intrinsic value which will materialize over time. Financial farmers are in essence buying into the American Dream at a ripe time. Further prosperity via innovation and growth in the underlying fields of business should provide a bumper crop for years to come. How do I like them apples? I love 'em!